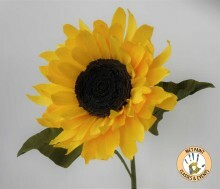 In this class you will learn basic techniques for making crepe paper flowers. Using doublette and heavy florist crepe paper, create a life-like sunflower inspired by autumn farmers markets and fields of brightly colored yellow flowers. This class is suitable for beginner flower makers but may offer new techniques and insights for intermediate paper flower artists.